Investors in Italy's Atlantia SpA faced record losses with the stock price crashing as much as a quarter, getting halted several times in the process, amid sliding bond prices, after the Italian government began the process of revoking its toll-road concession after the deadly Genoa bridge collapse which killed 39 people. The stock dropped as much as 26% in Milan, the most on record, after a delayed opening as markets were closed in Italy on Wednesday for the Ferragosto holiday. The move erased over $5 billion in value. 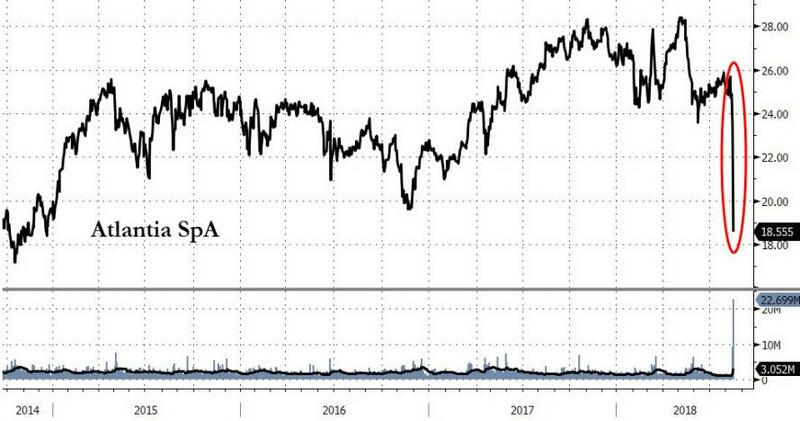 meanwhile, some of the bonds of Atlantia and the highways unit that operated the Genoa bridge, Autostrade per l’Italia, fell to their lowest levels on record. 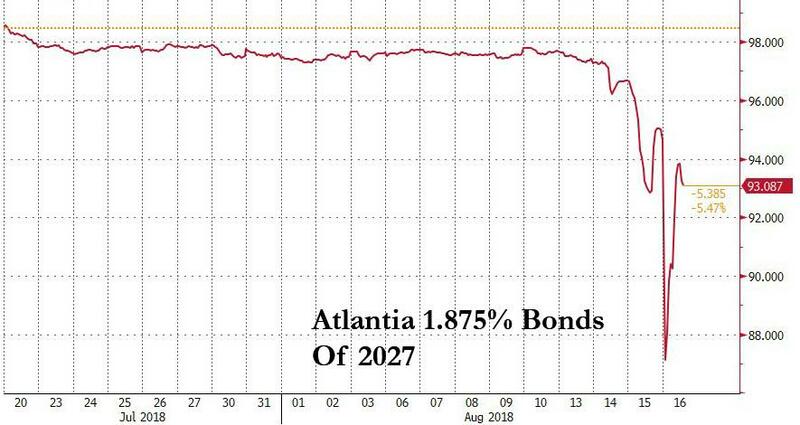 Atlantia’s $1BN of 1.875% bonds due July 2027 plunged below 89 cents on the euro, the lowest since they were issued. The 700 million euros of notes due September 2029 issued by Autostrade fell below 92 cents on the euro, also a record. Meanwhile, Atlantia's CDS soared, and the cost of insuring against an Atlantia default soared 126 basis points on Thursday to 300bps, the highest since the European sovereign debt crisis. The disaster sparked political finger-pointing and prompted the populist government to revoke the lucrative toll-road concession, wiping out billions in enterprise value. According to Bloomberg, "that’s thrown Atlantia and its largest shareholder, Italy’s powerful Benetton family, into a fight to salvage its investment and protect its fortune amid rising anger over the tragedy that killed at least 39 people." The panic started late on Wednesday, when Prime Minister Giuseppe Conte told reporters that the government will “start the procedure to revoke Autostrade’s license" and added that officials won’t wait for the outcome of a probe or a trial to take action. Additionally, the government may limit the license-withdrawal to the A10 highway that includes the bridge, not the entire toll-road network run by Autostrade, according to a Transport Ministry official who asked not to be named in line with internal policy. The plunge in Atlantia follows the tragedy of the Morandi bridge, which collapsed in a heavy rain on Tuesday, causing more than two dozen vehicles to drop to the railroad tracks about 150 feet below, and leading to 39 deaths. It was built in the 1960s, and was part of a major artery connecting the Italian Riviera to the southern coast of France. Giovanni Castellucci, the chief executive officer of both Atlantia and Autostrade, has become a focus of anger over the tragedy, as politicians called for his removal. The Autostrade unit will hold an emergency board meeting early next week to evaluate the impact of the tragedy on its business and respond to government’s request, people familiar with the matter told Bloomberg News late Wednesday. The CEO has the support of the Benetton family and has no current plan to resign, one of the people said. Edidizione Srl, the family’s holding company, said it will do “everything in its power to discover the truth and the responsibilities” for the Genoa disaster, while extending condolences to the families of the victims. Edizione said Autostrade has invested over 10 billion euros in the last 10 years to widen and modernize the Italian highway network. Of course, if only corporations spent a fraction of what they put into buybacks on capex and keeping their asset base new, tragedies such as this one could likely be avoided.